PHELRENA-The professional racing swimming goggles. Coated lens: The lens is made of polycarbonate and imported high-grade silica gel, with long-lasting anti fog, anti UV, anti impact effect. Spectacles frame: The frame according to the design principle of the streamlined and Ergonomic design. The straps of the goggles: Adjustable silicone head strap, strong elasticity can suitable for people of different sizes and comfortable wear. Bridge of the nose: three interchangeable nose pieces are available to different people. Sealed type silicone ring can prevent leakages. Heightening thickening of the design can reduce eye pressure, let you enjoy the fun of swimming.So,swimming goggles phelrena is anti fog uv protection no leaking shatterproof swimming goggles. ◆Long term use may reduce the effect of anti fog coating. You should take the goggles in the water, gently shake, or rinse with water, so you can keep the anti fog coating work. 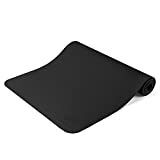 ◆Never wipe the lens as this can remove or scratch the anti-fog coating. You should keep them away from dirt and grease, store carefully to avoid scratching. ◆Don’t leave your goggles out under direct sunlight as this can dry the soft silicone seals and fade its color. ◆Protect your swimming goggles by storing them in their protective case. If you are not satisfied with this purchase, we will spare no effort to meet your requirements including refund. 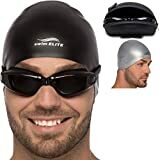 Clicking on the ADD TO CART button now，to get the best swim goggle. ◆UV PROTECTION:PHELRENA 3d swimming goggles is professional racing goggles. 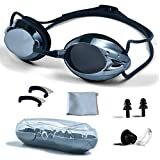 The lenses of the 3d goggles glasses are treated with ultraviolet light absorber that can effectively block the sun’s harmful UVA and UVB rays and protect your eyes from the sun’s harmful damage.The top-rated swimming goggles with nose clip ear plugs of silicone,clean cloth and protection box cases to solve the problem that your glasses of no nose ear plugs. 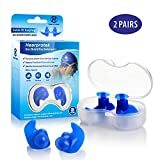 Ear plugs, nose clips are advanced silicone materials. ◆REPLACEABLE NOSE BRIDGE: Considering that different people will have different height of nose pieces and one size of Nose Bridge can’t meet the needs of all people, so the swimming goggles provide 3 sizes replaceable nose bridge to meet the needs of different people.Elastic straps to make the wearer more comfortable. ◆100% LIFETIME SATISFACTION GUARANTEE:Yes, you read that correctly! We provide a LIFETIME GUARANTEE to all customers who purchase our swimming goggles. If you are not satisfied with your purchase, what we can do is to guarantee 100% refund to you. 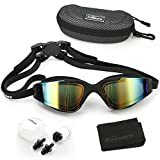 We are committed to our customers to provide the best swimming goggles, the most sincere after-sale service, let customers really enjoy the fun of buying.